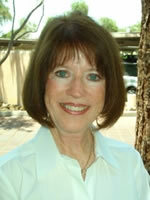 Terri Mansfield is Co-Founder & Executive Director of the Arizona Department of Peace Campaign. She has publicly appeared as a UFO witness of the 1997 Phoenix Lights sightings and was featured in an award winning documentary on the 1997 Phoenix Lights sightings. She is interested in promoting peaceful relations with extraterrestrial visitors, and ending efforts to weaponize space. Terri Mansfield is a former member of the Advisory Board of the Exopolitics Institute.